Got an itchy dog? Using coat conditioner after bathing can make a dramatic difference in the health of your dog’s skin and coat. Hard to brush? We wouldn’t dream of not using conditioner on our own hair but most pet owners never think that their dogs need quality coat care too. Even dogs with short coats can benefit greatly by the addition of a quality conditioner after the bath. You can spend a fortune at the vet’s office trying to treat skin problems when just using nourishing grooming products and daily probiotics can work when nothing else helps! 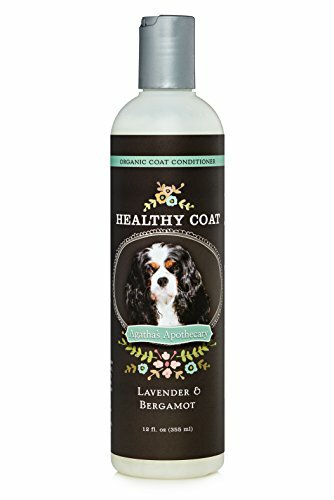 Healthy Coat Conditioner is a unique blend of aloe, sunflower and coconut oils, oatmeal, Vitamin B, Panthenol, organic lavender oil and bergamot to lightly fragrance your smelly dog while making her coat shine with health. Use after bathing and rinsing your dog.. Massage one or two tablespoons into the coat for 60 seconds, rinse with warm water and and watch your dog’s coat become silky and more healthy every time you use it!